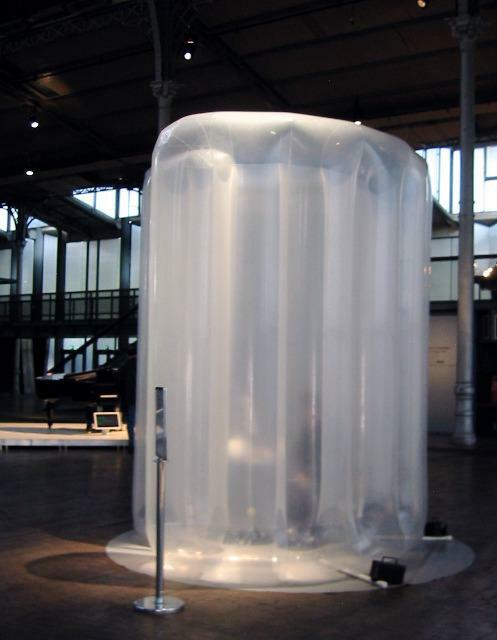 "Agora Phobia (digitalis) is a mobile monument for 'public isolation'. Travelling since 2000 in city public spaces such as Amsterdam, Paris, New York, Berlin it questions and archives mental images and strategies for being (un)safe and isolated. The project connects social experiences in both the physical and the virtual space creating a hybrid agora. In the Isolation Pillar is an online computer. You are invited for an online dialogue with someone who lives isolated somewhere else, such as someone who has been living in prison, someone who lives in a cloister, someone living illegally in the city, a digi-persona, someone suffering from agoraphobia - who are invited as 'experience-specialists'."